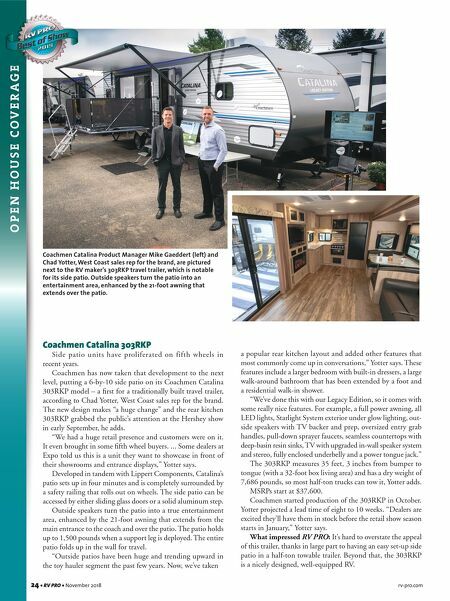 24 • RV PRO • November 2018 rv-pro.com O P E N H O U S E C O V E R A G E Coachmen Catalina 303RKP Side patio units have proliferated on fifth wheels in recent years. Coachmen has now taken that development to the next level, putting a 6-by-10 side patio on its Coachmen Catalina 303RKP model – a first for a traditionally built travel trailer, according to Chad Yotter, West Coast sales rep for the brand. The new design makes "a huge change" and the rear kitchen 303RKP grabbed the public's attention at the Hershey show in early September, he adds. "We had a huge retail presence and customers were on it. It even brought in some fifth wheel buyers. ... Some dealers at Expo told us this is a unit they want to showcase in front of their showrooms and entrance displays," Yotter says. Developed in tandem with Lippert Components, Catalina's patio sets up in four minutes and is completely surrounded by a safety railing that rolls out on wheels. The side patio can be accessed by either sliding glass doors or a solid aluminum step. Outside speakers turn the patio into a true entertainment area, enhanced by the 21-foot awning that extends from the main entrance to the coach and over the patio. The patio holds up to 1,500 pounds when a support leg is deployed. The entire patio folds up in the wall for travel. "Outside patios have been huge and trending upward in the toy hauler segment the past few years. Now, we've taken a popular rear kitchen layout and added other features that most commonly come up in conversations," Yotter says. These features include a larger bedroom with built-in dressers, a large walk-around bathroom that has been extended by a foot and a residential walk-in shower. "We've done this with our Legacy Edition, so it comes with some really nice features. 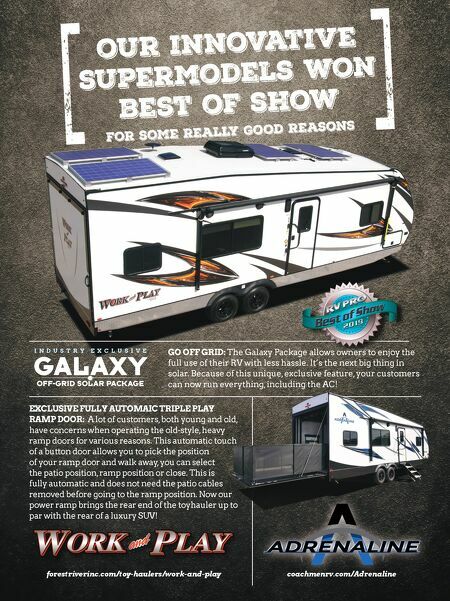 For example, a full power awning, all LED lights, Starlight System exterior under glow lighting, out- side speakers with TV backer and prep, oversized entry grab handles, pull-down sprayer faucets, seamless countertops with deep-basin resin sinks, TV with upgraded in-wall speaker system and stereo, fully enclosed underbelly and a power tongue jack." The 303RKP measures 35 feet, 3 inches from bumper to tongue (with a 32-foot box living area) and has a dry weight of 7,686 pounds, so most half-ton trucks can tow it, Yotter adds. MSRPs start at $37,600. Coachmen started production of the 303RKP in October. Yotter projected a lead time of eight to 10 weeks. "Dealers are excited they'll have them in stock before the retail show season starts in January," Yotter says. What impressed RV PRO: It's hard to overstate the appeal of this trailer, thanks in large part to having an easy set-up side patio in a half-ton towable trailer. Beyond that, the 303RKP is a nicely designed, well-equipped RV. Coachmen Catalina Product Manager Mike Gaeddert (left) and Chad Yotter, West Coast sales rep for the brand, are pictured next to the RV maker's 303RKP travel trailer, which is notable for its side patio. Outside speakers turn the patio into an entertainment area, enhanced by the 21-foot awning that extends over the patio.